Charles Darwin’s famous theory of natural selection shook the world of science to its core, challenging centuries of orthodox beliefs about life itself. Darwin’s boundary-shattering treatise was captured in On the Origin of Species, originally published in 1859, a groundbreaking and detailed study on ecological interrelatedness, the complexity of animal and plant life, and the realities of evolution. This Young Reader’s Edition makes Darwin’s cornerstone of modern science accessible to readers of all ages. Meticulously curated to honor Darwin’s original text, this compelling edition also provides contemporary insight, photographs, illustrations, and more. This adaptation is a must-have for any reader with a curious mind and the desire to explore one of the most influential books of our time. Wheat still produces new variations, even though it has been domesticated for ten thousand years or so. "The bible of evolution theory—condensed, glossed, furnished with updates, and enlivened with vivid photos and images... Big, bright nature photos or period engravings and paintings on nearly every large spread... Stefoff's frequent glosses and boxed side essays unpack major concepts, add historical context, explain how later scientific discoveries modify or support Darwin's broad picture, and even studiously point out where the author went wrong... handsomely presented and so close to the source... a glossy edition of one of science's most fundamental works." "This attractive, oversize adaptation of Charles Darwin’s classic work of science has been shortened, updated, and streamlined for clarity and readability... Vocabulary words appear in bold throughout the text, while sidebars and supplemental sections delve into related topics... Bright photographs and illustrations of plants, animals, and habitats provide an expansive and inviting visual element. With valuable modifications and enhancements, Stefoff preserves the richness of Darwin’s content for contemporary young readers." 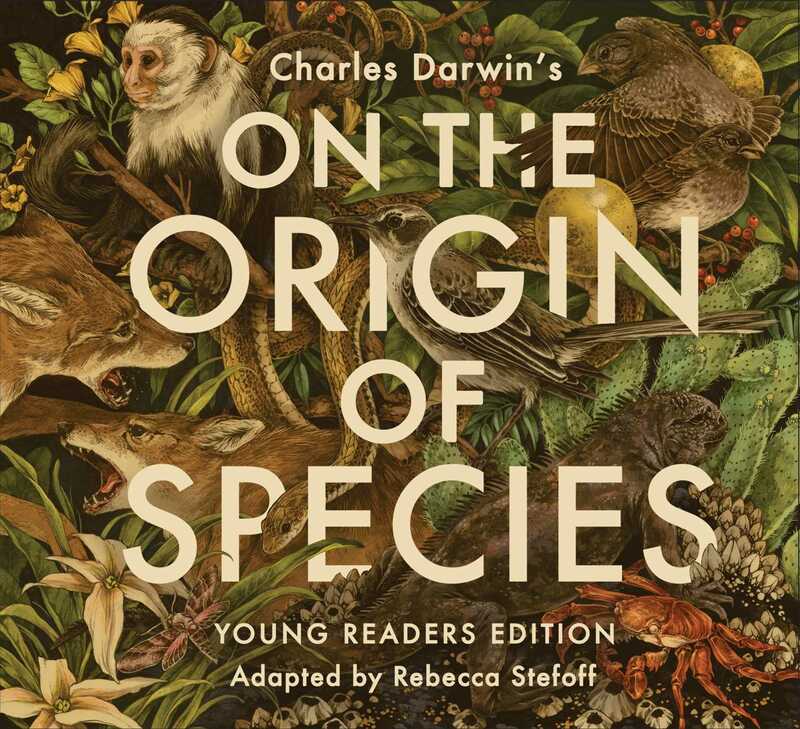 "This handsome, large-format book offers a “young readers edition” of Darwin’s classic, adapted by Stefoff. In the introduction, she explains that her process involved shortening the text by removing outdated sections and multiple examples supporting aspects of his theory. She also simplified the writing somewhat, while preserving “as much of Darwin’s original language as possible.” In addition to her many useful notes in the margins, commenting on words and phrases highlighted in the text, she has added sidebars and full-page articles usually intended to bring the science up-to-date, discussing topics such as continental drift, DNA, and the term species as used by Darwin, his contemporaries, and scientists today. Most of the spacious double-page spreads feature one or more illustrations, including many color photos as well as period drawings, prints, and photos. An ever-increasing number of science books introduce Darwin’s work to young readers. The strength of this attractive volume is that it gives them direct access to Darwin's words on the topic of natural selection, along with informative updates and explanations." "A streamlined, simplified version [of Darwin's manifesto], helped along by an introduction covering biographical information on Darwin—kids might be interested to know he was not a standout student."